1. 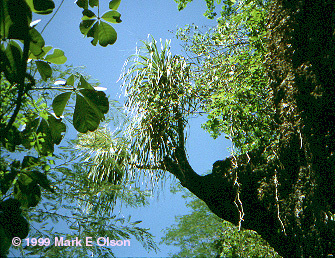 An individual of the Ponytail Palm Beaucarnea recurvata growing directly out of a vertical limestone cliff face, seen from below. 2. Beaucarnea gracilis. Note the deeply furrowed bark that would look at home on a pine tree. 3. The tree on the middle right is a B. gracilis. Though they look like Century Plants (Agave), the green, spiky rosettes in the foreground are a member of the genus Hechtia, in the Pineapple Family (Bromeliaceae)! 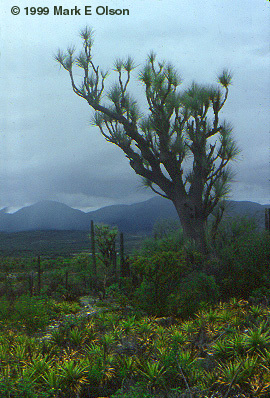 One of the shrubs at the base of the Beaucarnea is a Setchellanthus, a mustard-oil producing plant placed in a family all by itself. Cardel, V. 1997. 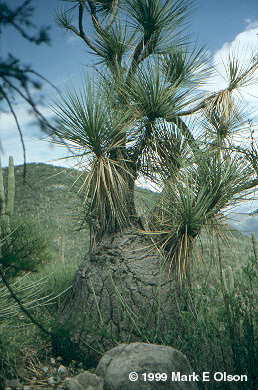 Ecological status of Beaucarnea gracilis, an endemic species of the semiarid Tehuacan Valley, Mexico. Conservation Biology 11 (2): 367-374.